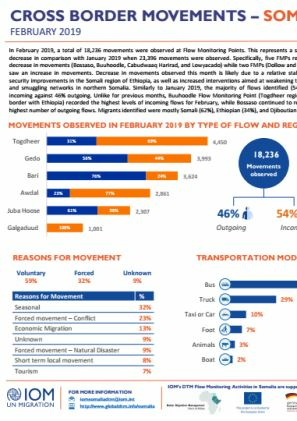 In February 2019, a total of 18,236 movements were observed at Flow Monitoring Points. This represents a significant decrease in comparison with January 2019 when 23,396 movements were observed. 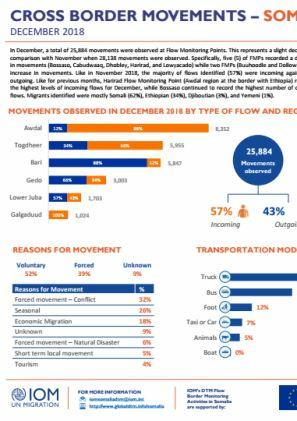 In December, a total of 25,884 movements were observed at Flow Monitoring Points. This represents a slight decrease in comparison with November when 28,138 movements were observed. A total of 60 individuals arrived in Kismayo IDP sites this week which is almost the same number as last week. The number of individuals exiting were 12. 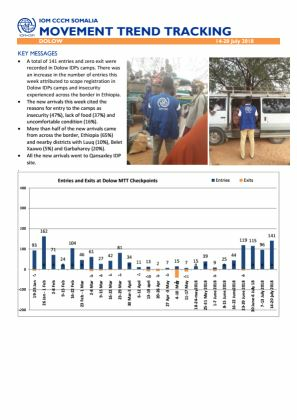 A total of 105 entries and zero exits were recorded in Dolow IDPs camps. 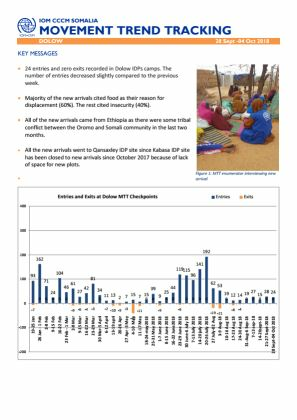 The number of refugees from Ethiopia and IDPs entering the camps this week reduced compared to the past two weeks. 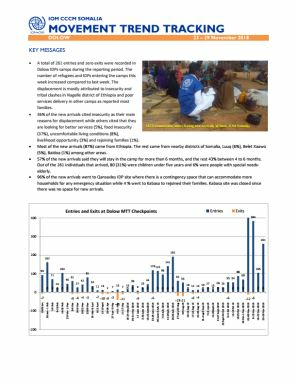 A total of 261 entries and zero exits were recorded in Dolow IDPs camps during the reporting period. 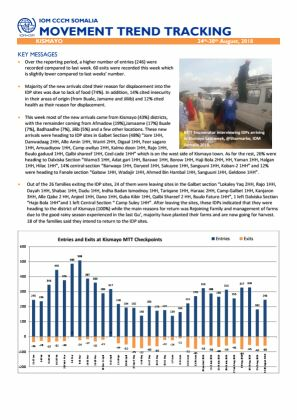 The number of refugees and IDPs entering the camps this week increased compared to last week. A total of 59 individuals arrived in Kismayo IDP sites this week. This is slightly lower compared to last week. There were no exits recorded this week. 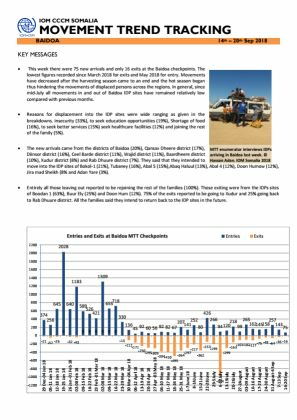 A total of 104 arrived in Baidoa IDP sites this week, almost similar numbers for the last four weeks. 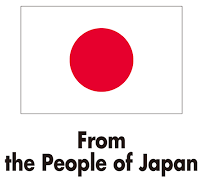 145 individuals exited the IDP sites. The number of exits has steadily been increasing since October 2018. The number of exits surpassed the number of entries. 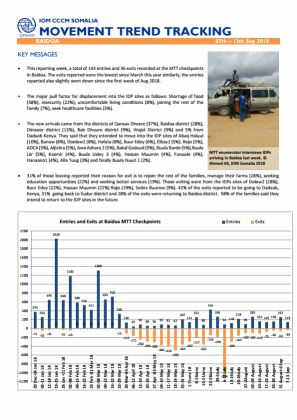 This week there were 159 new arrivals and only 56 exits recorded. This is the lowest recorded of exit since Mid‐ October of this year. 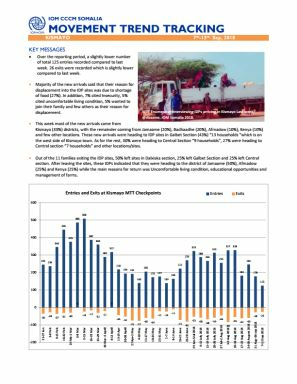 The key driving factors for displacement into the IDP sites was insecurity and those leaving cited management of their farms. 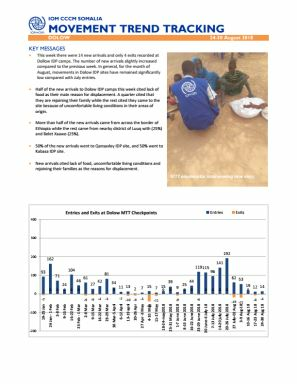 24 entries and zero exits were recorded in Dolow IDP camps between 28 September and 4 October 2018. The number of entries decreased slightly compared to the previous week. 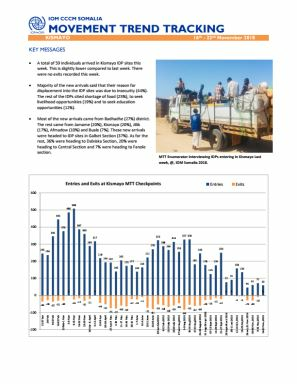 The majority of the new arrivals cited food as their reason for displacement (60%) while the rest cited insecurity (40%). Over the reporting period, a total number of 77 entries was recorded, which was lower than the number of entries recorded in the previous week. No exits were recorded between 28 September and 4 October 2018. 317 entries and 11 exitas were reported across all the checkpoints this week. The trend highlights a slight decrease on entries compared to last week. Few exits were recorded this week, the lowest number since March 2018. 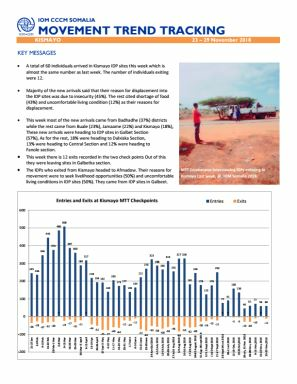 This week there were 75 new arrivals and only 16 exits at the Baidoa checkpoints. The lowest figures recorded since March 2018 for exits and May 2018 for entry. 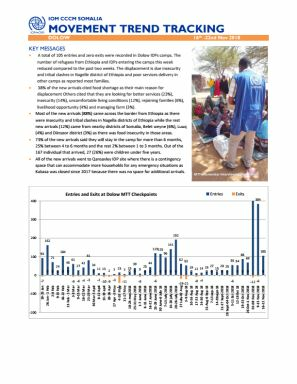 This week there were 27 new arrivals and no exits recorded at the Dolow IDP camps. The number of new arrivals slightly increased compared to the previous week. 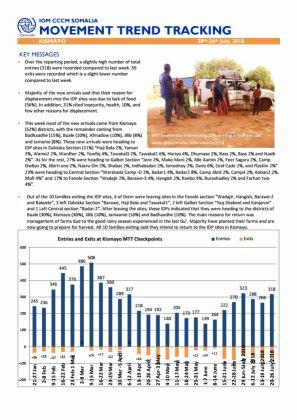 This reporting week, a total of 143 entries and 36 exits were recorded at the MTT checkpoints in Baidoa. 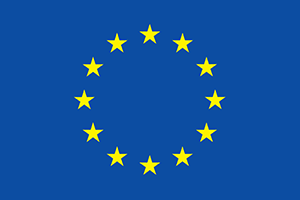 The exits reported were the lowest since March of this year similarly, the entries reported also slightly went down since the first week of August 2018. 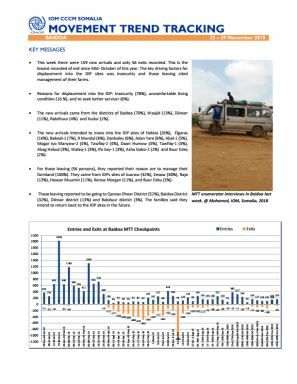 This reporting week, a total of 15 new entries and zero exits were recorded in the Dolow IDPs camps. This shows a decrease in those coming in when compared with the previous week. Similarly, the number of exits has been shrinking and has since late August 2018 remained zero. Over the reporting period, a slightly lower number of entries were recorded (125) when compared to the previous week. 26 exits were recorded, which is slightly lower compared to last week. 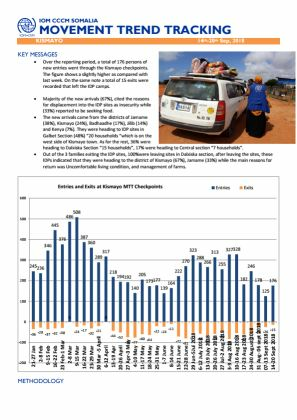 Over the reporting period, a total of 176 new entries went through the Kismayo checkpoints. The figure is slightly higher than the last week. 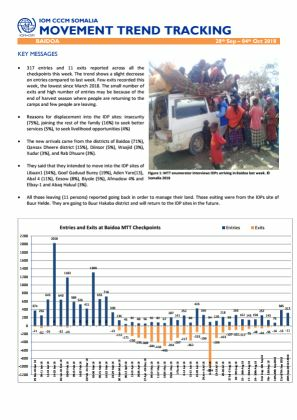 On the same note a total of 15 exits were recorded leaving the IDP camps. 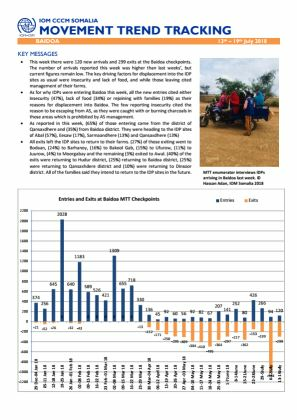 This week there were 158 new arrivals and only 48 exits at the Baidoa checkpoints. The lowest recorded of exit since March of this year. This represents the fifth week in a row that the number of exits has remained below 200. Over the reporting period, a higher number of entries (246) were recorded compared to the previous week. 60 exits were recorded this week, which is slightly lower compared to the last weeks’ number. 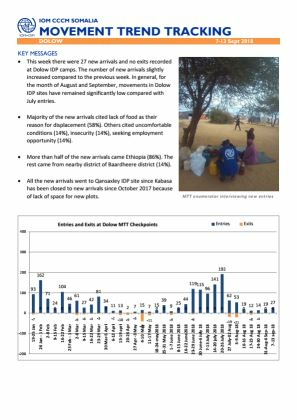 This week there were 14 new arrivals and only 4 exits recorded at the Dolow IDP camps. The number of new arrivals slightly increased compared to the previous week. 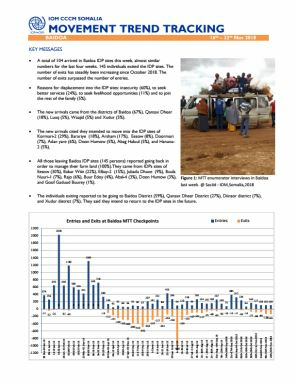 In general, for the month of August, movements in Dolow IDP sites have remained significantly low compared with July entries. 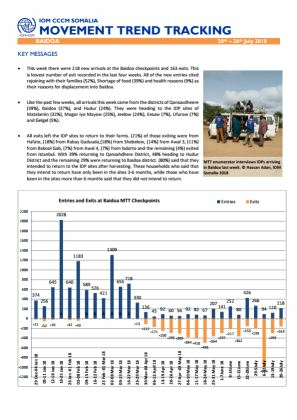 This week there were 120 new arrivals and 299 exits at the Baidoa checkpoints. 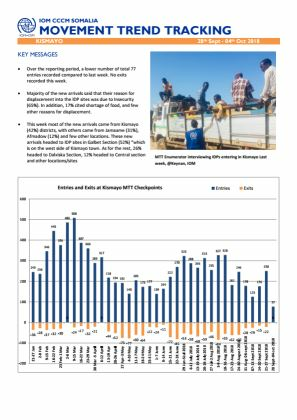 The number of arrivals reported this week was higher than last weeks’, but current figures remain low. Over the reporting period, a slightly high number of total entries (318) were recorded compared to last week. 59 exits were recorded which is a slight lower number compared to last week. 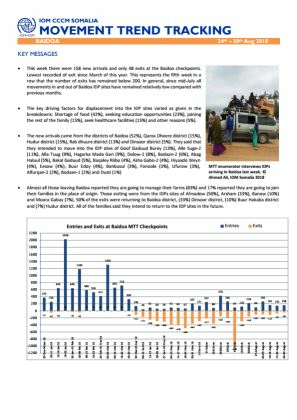 This week there were 218 new arrivals at the Baidoa checkpoints and 163 exits. This is lowest number of exit recorded in the last four weeks. A total of 141 entries and zero exit were recorded in Dolow IDPs camps. 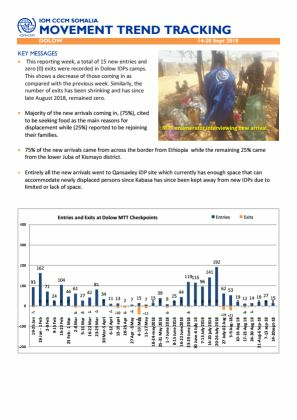 There was an increase in the number of entries this week attributed to scope registration in Dolow IDPs camps and insecurity experienced across the border in Ethiopia.